Roxy Paine's "Maelstrom" will be installed in the Met Museum's roof garden until October 25, 2009. The Metropolitan Museum of Art has again turned over its roof deck to a single artist for the entire summer. 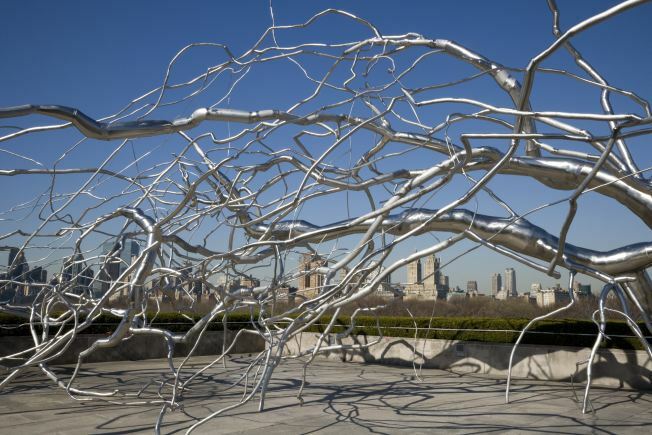 This year the garden above Central Park will host Roxy Paine's tree-like stainless-steel sculpture "Maelstrom." Paine, who lives and works in Brooklyn, Long Island City and Treadwell, New York, created the sculpture as part of his "Dendroids" series. In his artist's statement, Paine said the term "opens up a conceptual framework. These projects have always referred to, and resonated with, not only botanical structures such as trees, but also vascular, neural, and geologic systems, as well as engineered structures. The 'oid' part of 'dendroid' is important to me as it suggests 'android' hybridization and robotization." The exhibition, which opens Tuesday and remains in place until October -- weather permitting -- covers nearly all of the roof garden, spindling out high and low. “Roxy Paine has created for the Metropolitan Museum his most remarkable work to date, a stunning sculpture that commands the environment through interaction. I feel certain that our visitors will marvel at the complexity of the structure, and delight in its beauty,” said Gary Tinterow, the Museum’s Engelhard Chairman of the Department of Nineteenth-Century, Modern, and Contemporary Art.